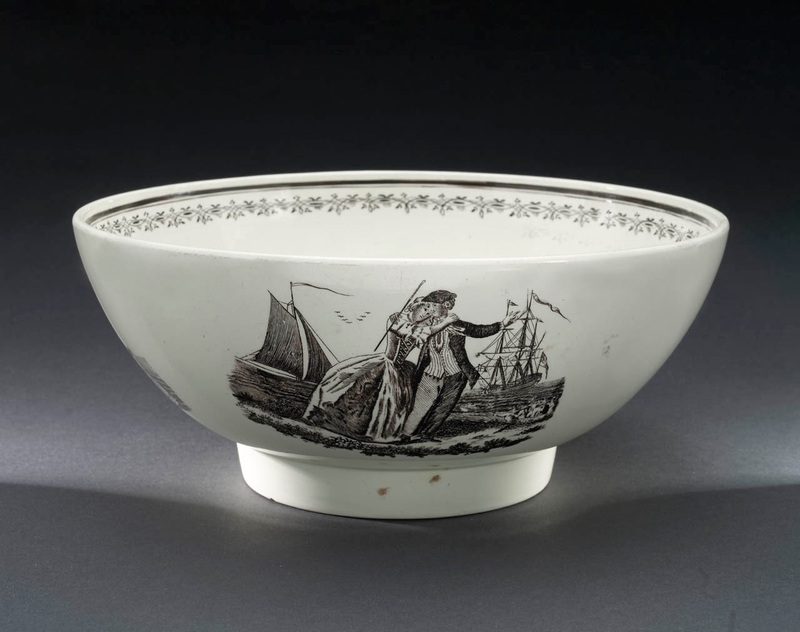 Punch bowl, Josiah Wedgwood & Sons, 1779, National Maritime Museum. This transfer decorated Wedgwood punch bowl features the familiar motif of the sea. On its exterior is the image of a sailor embracing his lass while gesturing away to the sea. A steady breeze blows at the sails and banners of the ships behind him, and in the same direction as his gesture, ready to carry him away with his mates. This tar wears the familiar simple black cocked hat without trim, turned backward or cocked so far to the side as to appear backward. His hair is cut short but is not unruly, tamed a bit for his lady no doubt. The neckcloth hides his collar, and is tied almost like a cravat, except that the loose ends blow in the breeze. This is significant for us as it gives us a view of his white shirt. As you might expect, it has a long slit down the front, and open on to his bare chest. This seems odd to modern eyes, but was very typical of the time. His long waistcoat is single breasted with narrow spaced buttons, ending below the waist with a slight cutaway. The diminutive size of the transfer does not allow us to say with any certainty what his buttons are made of. His waistcoat fabric is decorated with narrow, vertical stripes. The jacket is without cuffs, lapels, or collar. It is single breasted and unlined. His trousers are notably dark, ending at the ankle. Unfortunately, the size and angle of the image does not provide enough detail for us to examine the shoes and buckles. In his right hand, the same with which he holds his lady, the sailor clutches the familiar stick so commonly seen among his profession.